If you’re preparing for the Patent Bar exam or considering making the switch to a career in patent law, you’ll need to start networking and conducting a job search. In this day and age there are a number of useful online tools to help make the networking and job search easier. LinkedIn is one of the biggest. 93% of recruiters use LinkedIn as their primary search tool (Jobvite). 1) Your headline is not your job title. The headline is 120 characters to market yourself on LinkedIn. It allows you to showcase your Unique Value Position to the business world. Start with The most important keyword you would like to be searched for. Next would be to add a couple of skills (keywords) that you have been endorsed for, and finally tell people how you can solve their problem. 2) Your profile should be outward focused. Your profile is not about you it should be focused on “whats in it for them”. If you are a lawyer what is your area of expertise. Succinctly showcase your specialty. Finally tell them how you can solve their problems (Pain points) by the experience you have had. Make sure you speak directly to your audience, in other words try to Influence the jury but do not speak in the third person. What will compel the decision-maker at the receiving end of your profile? 3) THE absolute best part of LinkedIn are the groups. You should join 45 groups. Join a few groups in your industry, local networking groups, alumni groups, and human resource groups. Everyone always asks why join HR groups? Because who does the sourcing, who does the recruiting, who does the headhunting, who does the hiring? A second reason to join groups is each groups will have a job section. Reason number three is because when you join into discussions in groups you will be able to demonstrate your expertise. And the final reason to join groups is to search for connections at target businesses. – Build your profile out completely including updated and professional photo – don’t forget to have a professional background. – Connect with people as quickly as possible after you meet them so you can start a meaningful dialogue; this will help you remember them easier. – As you network, ask how you can help others. People are much more likely to help you if you offer to assist them. – Join groups so you can watch people post and comment. Find people that you are interested in connecting with and send them a personalized connection request. – Create Tags so you can group people into logical categories. – Post relevant content once a day to keep your profile at the top of the activity feed. – Learn how to turn on/off your activity broadcasts in the settings so when you update your profile, every little update doesn’t get broadcast. You can always go back in and turn it back on when you’ve made the adjustments. – For job searches, find people who you will interview with and find things you have in common to discuss. You can also research companies that you want to get more familiar with a company that is of interest to you. Do not just put your resume up on LinkedIn. Customize each section to meet your goals and attract your target audience. Be specific about what you’re looking for, what you enjoy, what you’re good at and why people value you. LinkedIn is one of the fastest growing ways to get your name in front of recruiters and employers looking to hire. I have found two jobs at startup companies in Los Angeles just based off their recruiters finding my profile. I believe it is one of the most underused job hunting tools because I hear my colleagues say things like, “I haven’t logged into my LinkedIn profile for months” or the cringe-worthy “I don’t even have a LinkedIn profile”. In any career, making connections and leveraging your network is the best way to keep moving up your respective ladder and that’s exactly what LinkedIn helps people do. By constantly updating my profile with descriptions of past jobs and my skill set I am getting inbound job offers from recruiters at least once a month! Not only that, but it’s a great place to follow groups with topics I’m interested in so I can continue learning and connecting with new people. It is advantageous to connect with recruiters and recruitment firms that source the type of position you are after within the specific industry you would like to work in. There are a number of ways to do this online. LinkedIn allows you to search the profiles of recruiters and send requests to connect to such individuals, who would likely be very welcoming of your invitation. Just be sure to have an updated profile with all your skills and experience clearly listed. Including a profile picture. Pictures help people remember who you are.. Obtaining recommendations. There is nothing wrong with asking for recommendations on LinkedIn. This is the equivalent of obtaining testimonials or references. Joining appropriate groups. There are numerous groups relevant to HR professionals on LinkedIn and some are specifically for the job seeker. The quality of LinkedIn skill endorsements remains questionable given that they can be provided with ease and are somewhat lacking in credibility. However, they are likely not completely untrue as it is improbable that multiple people would endorse the same individual for skills that the individual does not actually possess. For example, a person is unlikely to be given a skill endorsement by 15 different people for “project management” when the individual have never managed a project. To this extent, skill endorsements retain some purpose and can work for candidates. At the very least, a large number of LinkedIn skill endorsements signifies that the individual was motivated to obtain a number of recommendations, which is a “trait” most organizations are definitely searching for. When searching for a job, there are countless sites to use to connect to the employers and hiring staff of companies looking for people just like you. LinkedIn is a useful tool to find a job. How to find and connect to these people through the 277 million other users is where the challenge is. By using the search engine in LinkedIn, you can search for jobs by the job title or by using keywords. When you type in the search bar “Public relations” for example, a list of jobs comes up. When you click on one of the jobs, you are able to see the connections you have in common with the person who posted the job. This feature makes it easier to get a job because you can use that person who is a common connection to write a networking email for you to help you land the position. Make yourself stand out. Post status updates about important conferences you are attending or events you are hosting. This makes you look like a solid professional in your field. Use visuals in your status update of the event or conference you attended to draw attention to your profile. When your job title on LinkedIn or your status changes, the keywords used will attract connections and jobs in that field to your profile. When going from one position to another on your “job title” section on LinkedIn, the results in “suggested jobs” changes to match your current job. Use this to your advantage and keep your profile and status updated regularly. Take recommendations seriously. If you have had a positive experience with a coworker, professor, internship mentor, etc, use that connection to build up recommendations on your profile. Writing a recommendation for someone usually results in receiving a one, so take the opportunity to write a recommendation for someone seriously, so that that person can vouch for you in the future. Think carefully before you post and don’t accept every LinkedIn invitation to connect. While everyone can agree that the social media site LinkedIn’s main purpose is for networking, LinkedIn cannot be compared to other social mediums like Facebook or Twitter where people share every aspect of their intimate lives. For the most part, LinkedIn is primarily used just for the professional world, setting it apart from other social media. Therefore, the “accepting of friend requests” should not be treated the same as other sites. The only time to use caution is when the LinkedIn user who is requesting to connect with you has no picture, only a few connections, or very little to no information. This anonymous person will not help to expand your network or make new connections so they’re not worth your “accept”. On sites like Facebook and Twitter personal information is shared, it is used to catch up with family and friends, or even to post vacation pictures. This is why you should use caution when accepting friend requests on these sites especially if you don’t want to mix your personal and professional lives. 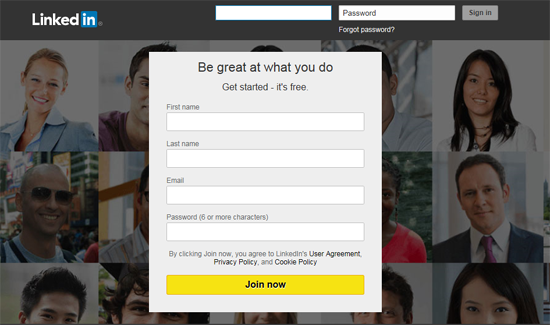 However, LinkedIn is used to expand your professional network, get jobs, look for new business, or seek new employees. LinkedIn advises people to accept “connections” only if you know a person well but I highly suggest against this. By limiting who you request, you are ultimately limiting your network, potential job and business opportunities, and chances to building genuine professional relationships. Your connections on LinkedIn are exposed to you professionally in the best way possible. Simply put, the bigger your network, the more opportunities. Accept the LinkedIn connection request. My primary source for job searching is through LinkedIn. There are two ways to approach landing a job through the platform. First, you can claim to be looking for a job in your title. The best way to land a job this way is to be a heavy contributor with groups of your industry and past education. I know from my experience that just commenting on my USC posts has increased the range of my network. Recruiters actively use LinkedIn and will often seek out college students, making this approach best suited for younger workers. The second approach is to use the job search through LinkedIn. Many companies post open positions through the website, and it is a great platform for seeing what types of jobs are getting the most applications. The only issue with this approach is that you will have to take the route of asking for introductions through your connections to people within a particular company you want to apply for. The important thing to remember about LinkedIn is that it is all about connections and networking. You are not going to land a job without an introduction or connection based at that company. I’ve also joined a variety of groups on LinkedIn that fit in with my interests which also make me a relevant candidate. I’ve been sought out by countless recruiters to fill positions due to my pertinent background. I’m an executive recruiter for high growth companies. My best year I placed 9 Director/VP level candidates sourced from LinkedIn. When writing your profile use the words that HR screeners are most likely to use when looking for someone with your background. It seems obvious but if you don’t use those words you will not appear in their searches. Don’t be afraid to reach out to people on LinkedIn. While they may not be able to give you a job they may be able to help you in other ways. Don’t ask for a job rather ask for a phone call. Look for ways to be of service to them. What is the job title of the person that would manage you? Search for those people on LinkedIn. You will be surprised at how many you will find in your immediate network. I have a reach of over 5,600 executives and a network of 17.8 million. That is a lot of people that I can reach with a simple post. Get involved in LinkedIn groups and don’t be afraid to ask for a connection. Make sure that the people you know, like, and trust are aware you are looking for a new opportunity. Ask them to introduce you to their friends in your field. Put your email and phone on LinkedIn so there is no cost to reach you. Yes, you will get spam but if you make contacting you easy people are more likely to do it. If you don’t want to put your phone at least put an email and invite them to connect. Get endorsements from senior people. This is part of what I use to screen candidates. If you give an endorsement most people will give you one in exchange. There is no substitute for politely asking someone you like as well. Also, take the time to put links to articles or other work you were involved in creating or quoted in. The more professional the profile the more people will want to connect to you. Don’t be passive. Just go out and ask for what you want. I cold call VPs of major companies all the time and they respond. The answer is always no if you don’t ask the question. Self-publish – LinkedIn now allows everyone to easily create their own blog posts. This is a very easy way to establish your expertise. If you apply for a job, follow the brand on LinkedIn and view the profile of your prospective manager and HR interviewer. This shows that you’ve done some research. Display areas of expertise as well as areas of growth and interest; show that you’re always learning new things and mention any courses you’re taking (even online, free ones). Make your summary concise and expressive. Provide specific examples and metrics of your successes. For attorneys, post brief case summaries or links to news coverage about your victories. We work with people every day who are looking to find new employment and LinkedIn is an excellent platform to do so. My tip is to be as active as possible within your area of expertise. Active does not mean trying to connect with everyone and their brother, it means joining relevant groups, commenting on articles, and doing what you can to make a name for yourself. List any content you may have written on your LinkedIn page. From there, it gives you an entry point for conversation. As an example, you can pen a piece about the effect of social media on the widget industry, and then reach out to a leader in that space to critique the said piece. While you have to make a real effort on LinkedIn to have it work for you, there is no question it can pay dividends and could get you in the door for that job you have always wanted. One suggestion is that anyone who intends on using LinkedIn (or any other social media platform) for a job search is to get started when you don’t need a job. Trying to spin up web activity and fast-track networking on social media doesn’t work well. One should build a network and establish themselves as an influencer before they are ever on a job search. Make publishing to LinkedIn, Twitter, Facebook, etc. a daily event. Use tools like Buffer to schedule updates in bulk to save time. I do a process using LinkedIn I call “Words-to-Work” wherein the candidate and I uncover jobs that are a “perfect” fit, determine what the most important keywords are for that job title, compare similar individuals’ keyword totals, then “out SEO” those similar candidates. In addition, the candidate connects with “Super Connectors” which allows the person to search deep into companies (practices) to find potential hiring managers or other contacts within the company. I also have them become Top Contributors in 4 industry-related groups since, according to LinkedIn, Top Contributors’ profiles are read at a rate 400% more often than non-contributors. LinkedIn is a social media tool that should be used extensively to promote personal interaction. A great way for attorneys to use LinkedIn is an active “body of evidence,” documenting and demonstrating their expertise, personality and career ambitions. Besides having a professional (smiling) photo, a two-three paragraph summary written in English, as opposed to “buzz” words (i.e. meaningless gibberish) that allows any reader to quickly understand what the attorney does, where she studied, any big name law professors she studied under, and any big cases/decisions she’s worked on, is a huge plus. But don’t stop there! LinkedIn allows you to share papers you’ve written, articles you’ve been quoted in, professional, or TV videos, you’ve been featured in, so all of that should be shared, and tag the company noted. So, for example, if you’ve been interviewed by local news on a big IP case you won, great! Share that both on your daily LinkedIn status, and as part of your experience, both times, “tagging” the news company; that way, any time someone searches on LinkedIn for that company, suddenly your video comes up. If you don’t have any videos, speeches, articles to share…what are you waiting for? Start writing and start submitting. In 2015, there are countless law sites and blogs, looking for smart content. A series of articles, or even a video blog, is a great way to share your expertise, your personality, and depending on who’s watching, your potential. Start pitching yourself to the next national IP conference. If that seems overwhelming, how about starting an alumni IP group for women, or minorities, as part of your law school’s alumni association? Get your colleagues together for purposes of networking and brainstorming. Create a LinkedIn alumni IP group, and keep the focus on smart conversation, and mentoring, instead of everyone selling themselves. Before you decide you don’t know enough to promote yourself…oh relax. You know just as much, if not more, than anyone else who is doing it. You just have to make a decision that your experience is valid, and that you have something important to contribute. Start small, but make a resolution to do even one thing today to use all of LinkedIn’s tools to create the opportunities your ambition requires. LinkedIn is certainly a vehicle by which professionals, particularly women, can market their personal/professional brand and ultimately it can assist them in advancing their career. First and foremost, have a complete LinkedIn profile. This means have your work experience, fill in the summary, have an attractive headline and make sure to select the skills using the Skills and Expertise section. Most often I find that my clients do not have enough content on their LinkedIn pages. I tell them that one way to remedy this is to copy their resume into LinkedIn so that they are consistent and they match. However, LinkedIn allows you to put even more information on your profile than you would necessarily put on a resume. Add a photo as people like to identify with a name and a face. As far as networking, first reach out to those you know. This can include coworkers, former classmates or other professionals you’ve met at conferences or professional events. Endorsements are best from people you know well and that have worked with you in some capacity. Also be willing to endorse those you have managed and worked with in the past or currently. Selectively join LinkedIn Groups as well with others who work in your field. Participating in the discussion can bring you into contact with other potential people to add to your network. For female professionals, there are a number of groups catered to women in different industries. Pick two or three of these to join and actively participate in discussions. One of the questions I get the most from clients is how to handle requests to connect from strangers. I say, determine first if there is some connection. I will often email the person requesting to connect to find out how they know me or what led them to connect. You will see many times people will want to connect based on some common interest or work experience. Ultimately, you have to determine if you are comfortable connecting, but if the person gives you a valid and professionally based reason, I say connect. Also follow companies that are of interest to you by going to their Company pages and clicking follow. Look for companies to follow that have a strong track record of hiring and promoting women through the ranks. There are awards given to organizations in this area so it should be easy to find some. Lastly the jobs on LinkedIn are a great resource. You can not only view jobs and when they were posted, you can see who posted the jobs. By clicking on their profile it’s easy to see how many degrees you are from the job poster, or if you have a contact in common. If you are able to get an introduction through a mutual colleague, do so. Also look at the poster’s profile. If they have LION (LinkedIn Open Networker) or mention that they are open to all new contacts in their profile, email them for more information about the posted opportunity. There’s no better way to network and start your job search than with LinkedIn. The platform is free and easy to use. If you’re currently studying for the Patent Bar or planning to in the near future, it’s best to start networking as early as possible. Use these tips to get started today! If you’ve used LinkedIn for a job search or networking let us know in the comments below or feel free to ask questions. We may add a new article based on your feedback.